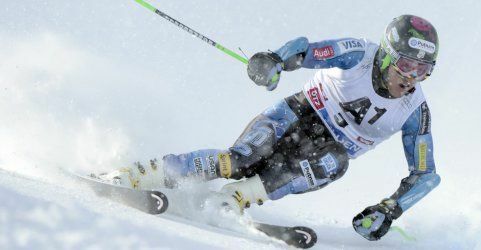 American Ted Ligety was one of the -if not the one- most critic about the new rules on GS skis, as he said they wouldn't make any difference in the speed, but would actually increase the risk of injuries. One would then believe that this change might actually set him back on earth, whereas he's been the best interpreter of the discipline over the past few years. Well this one was surely surprised at the end of today's race, as not only he won, once again, but he completely destroyed the chances of everybody else, as the first mortal, Italian Manfred Moelgg, finished almost 3 seconds behind Teddy! What makes it even more scary, is that the scenario after the first run was rather different. The huge snowfall that kept blowing a lot of snow throughout the night gave a lot of troubles to the organizers, but after a great effort the race could start, but the whole course was slowed down by the fresh snow, mostly for the first racers and very soon a lot of bumps ruined the course. Austrian Philipp Schoerghofer, unluckily for him, had the duty to open the race and couldn't even qualify for the second run as slow it was the last flat part of the slope. Passage by passage the course got a little faster though, but of the top group only Ligety could score a time good enough to stay into the very top places after the first run. On the contrary French Thomas Fanara could take advantage of the little faster surface and by attacking the course from the very first gates with no fear for the bumps he could set the best time, by placing few hundreths ahead of the American. Swedish Myrher and Austrian Baumed too, made solid runs and placed themself just behind Ligety and then with bib 21 Italian Moelgg showed a great attitude and even if he looked on the point of falling many times, he could stay up and score a terrific run, which placed him 3rd. In the huge snowfall and the bad visibility a few guys from behind could find the right intuition to score a good run and so, quite many of them could qualify for the second run. Cyprien Richard opened that second partial, but he wasn't really lucky and went out before time, then it was Roy's turn, and the Canadia made a really solid run even if at first it didn't look like one, as the very next racer, Slovakian newcomer Adam Zampa, destroyed his leadership with a terrific and brave run that would eventually give him a long-lasting leadership and a final placement into the top 10, 9th at his very first 2nd run in World Cup! Such a great achievement for the young guy from Vysoké Tatry, who had showed terrific improvements in the past few seasons, thanks to a very commendable hard work! Zampa's run was so good that in the end his time was the 2nd best and could take him ahead of champions like Kostelic, Bauman and Mathis! Only when the top tenners of the first run were to come down, the advantage over the Slovakian was big enough to let them overcome him at the finish line. When it was last year's champion's turn, everyone expecred a great reaction from Hirscher, who didn't look very good in the first run and so it was. The Austrian seemed to shake out all the doubts and attacked like only he can do and leaded the race for a few intense moment. The conditions of the weather were very tough and so the course, with all the bumps impossible to be seen in the snowstorm and so many runners fell or went out earlyon and after the exit of Simoncelli, Italian fans were holding their breaths while Manfred Moelgg was skiing down the hill. Once again, like in the first run, the Italian looked always risking a little too much as if he was about to crash, but again he didn't and when he crossed the finish line he ended Hirscher's leadership. His own was to last very few though, as Ted Ligety seemed not to be bothered by the fog or the snow and skied as if it was smooth and sunny, scoring a crazy good time, 2.75 seconds faster than the Italian and nothing could the first run's leader Fanara apart from trying to go beyond his limits. Too bad for the French it didn't work and he lost the podium too, finishing 4th.